Happy November! Today we are sharing our second recipe in partnership with Phoenix Public Market, Mediterranean Salad Toast! Each month we will share a recipe that utilizes ingredients primarily found at the farmer’s market. Recipes may also use ingredients commonly found at home (ie: milk, salt, flour, etc.). We have found that having a recipe in hand helps when shopping helps quite a bit (for more tips, take a peek at our Farmer’s Market Survival Guide). For this recipe, we are primarily featuring Chile Acres Farms and Noble Bread. Noble Bread is a valley staple and makes some of the most delicious bread you could imagine. It is the perfect bread for toast, soft in the middle with a flavorful crust. 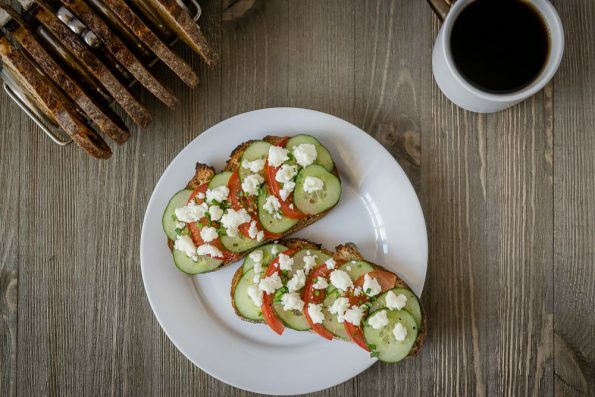 For the cheese we used Chile Acres Feta which is perfectly salty and just right for this inspired toast recipe. We can’t wait to create more recipes for the Phoenix Public Market, especially for the holidays! What ingredients you want to see? Do you want side dishes, main dishes, or something entirely different? We want to help you and this is how you can make that happen! Let us know in the comments below or using the hash tag #GeekEats! Arrange cucumber and tomato in desired look. Top with feta cheese, chives and seasoning.